There are no conference registration fees. 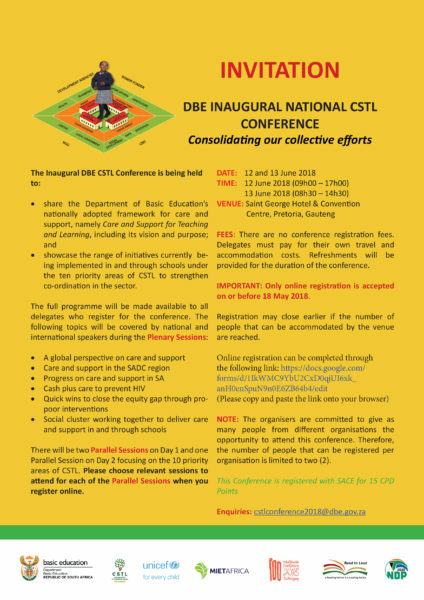 Delegates must pay for their own travel and accommodation costs. Refreshments will beprovided for the duration of the conference. IMPORTANT: Only online registration is accepted on or before 18 May 2018. MIET AFRICA received a Certificate of Recognition as a partner of the North West Province of Education’s Quality Learning and Teacher Campaign for the Education: My right! My future! project at the Quality Learning and Teaching Awards ceremony held recently in Mahikeng. Education: My right! My future! is a three-year partnership between MIET AFRICA, the Department of Basic Education and the National Education Collaboration Trust with funding from Educate a Child. It seeks to bring 30 000 out-of-school children in six districts across four provinces back to school, and to ensure they attend school regularly and complete their primary schooling. MIET AFRICA was recognised as a key partner in supporting out of school children in the Bojanala District of the Province. 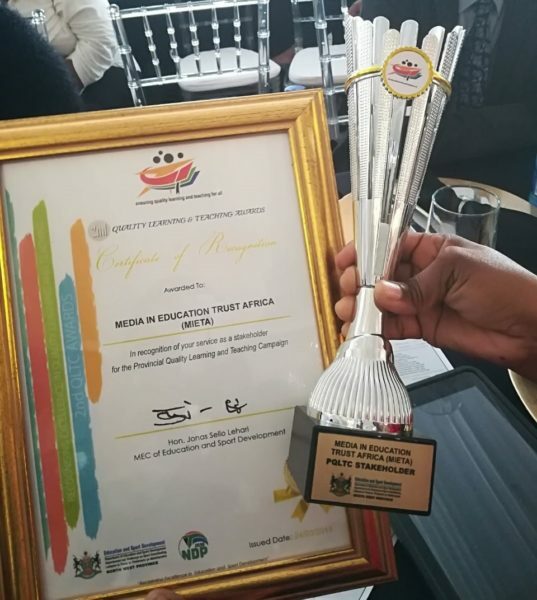 In addition, MIET AFRICA’s five parental volunteers/training co-ordinator assistants also received awards in the Excellence in Volunteerism (Parental Volunteers) category. The Quality Learning and Teaching Campaign (QLTC) is a national intervention intended to mobilise stakeholders to play a role in promoting a culture of teaching and learning in schools.